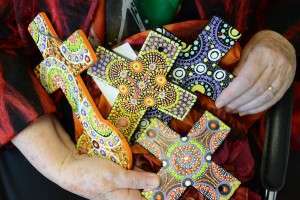 Loreto Sister Susan Daily was awarded the Order of Australia last month in recognition for her commitment to the arts, building independence among Aboriginal communities and developing a genuine Australian religious art form. The official announcement was made on June 8. Beaming with excitement Susan explains the award came as a complete shock and she struggled to keep it a secret from her friends and family for two weeks before the official announcement. For over 26 years Susan has dedicated much of her life to volunteering her time as an art mentor and empowering Aboriginal women to gain independence through the sacredness of art. Susan’s work takes her to many parts of Australia. In the past year she has offered guidance at both the Merrepen Arts and Santa Teresa Aboriginal communities in the Northern Territory and currently teaches in Melbourne at an innovative art supply house. 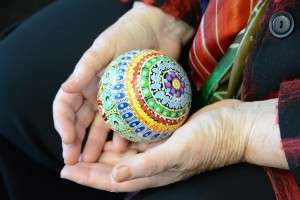 Susan understands the importance of sustainability and hopes her lessons in art technique will foster independence among the women working in the local aboriginal art centres. “It is important for the independence of the artists to encourage them to run their own art centres by offering suggestions to make their new ideas happen”. “Drawing has helped me to make some meaning of my highs and lows of life… I use it in my prayer and know when I do not I am much the poorer for it”. After graduating from Loreto Mandeville in 1962 Susan attended art school for a year before deciding to become a Loreto Sister. She was not the first religious artist in her family – Her great aunt, a sister of Mercy, Sr. Bernadine Carr is well known for her coats of arms paintings for the Bishops of Australia. Susan has been a Loreto Sister for over 51 years and in that time has seen an emergence of technology that she now enjoys utilising in her designs, creating resources that can be used across the church. The majority of Susan’s art is now designed using her iPad which she has the option of transferring onto silk banners – another art technique which she is well known for amongst the wider community. She is now working towards making churches more beautiful through the work of her silk banners. Susan is the seventh Loreto Sister to have received an award.